Make the cupcakes: Pre-heat oven to 350°F. Line muffin tins (2-1/2 inches in diameter) with paper baking cups; set aside. Stir together the sugar, flour, cocoa, baking powder, baking soda and salt in large bowl. Add the eggs, milk, oil and vanilla, and beat with a hand mixer on medium speed for about 2 minutes. Stir in the coffee (the batter will be thin). Fill each paper cup about 2/3 full with batter. Bake for 22 to 25 minutes, or until a toothpick inserted into the center of a cake comes out clean. Cool completely (Note: cupcakes can be stored up to 2 days at room temperature, or frozen up to 2 months, in airtight containers). Make the ganache: place the chocolate pieces into a heatproof bowl, and set aside. Heat the heavy cream in a small saucepan until it starts to bubble (just before the boiling point). Remove from the heat and pour the cream over the chocolate – allow to sit for a minute or so. Insert a whisk into the center of the chocolate and gently stir, starting from the center and slowly working towards the edges (it will look really weird at first, and gradually turn into beautiful melted chocolate). Stir in the the Kahlua – place in the fridge and allow to chill for 15 to 20 minutes (until it is at a piping consistency). Fill the cupcakes: with an apple corer or paring knife, cut a hole in the top of each cupcake (it should reach about halfway down the cake). Scoop the ganache into a large plastic bag, and snip off a corner – pipe the ganache into the cupcakes (until it just reaches the top). Make the frosting: pour the heavy cream into a bowl, and whip with a hand mixer (at medium speed) until stiff peaks just start to form (be careful not to overbeat). In a separate bowl, whip the mascarpone with the sugar until smooth and combined – carefully fold the mascarpone into the whipped cream. 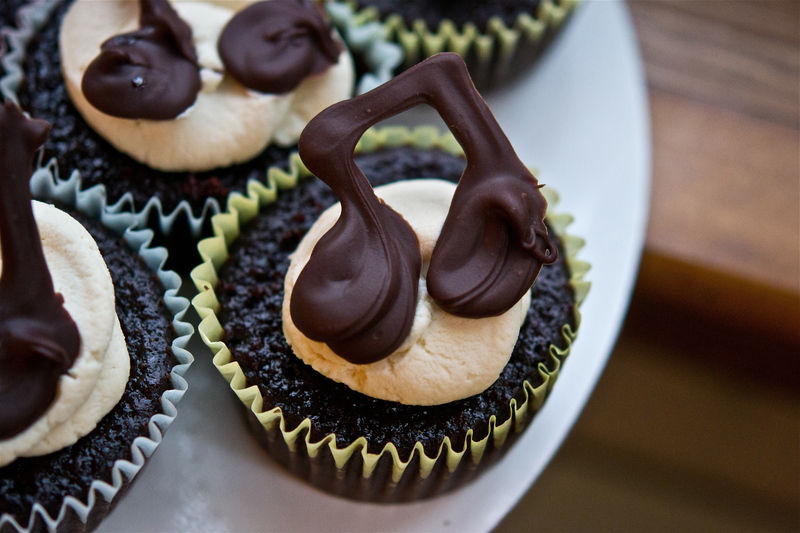 Pipe onto the cupcakes, and serve immediately. To read more about this cake and my musical pairing, click HERE.